Holy cats, I am back! Can you believe it? I can’t. Anyway, a few months back I had the crew over for a fun weekend full of horror movies, beers and food challenges. It is a rare thing to have a group of people who all nerd-out over the same things. You know Ben, Brian and Dave (DJ D). They have been on here before. On this episode of “what were we thinking”, Ben introduced us to Epic Bars; the bars made of grass-fed, organic, paleo friendly, gluten-free beef and turkey. Let’s just say we had a time trying these bars. A trying time. 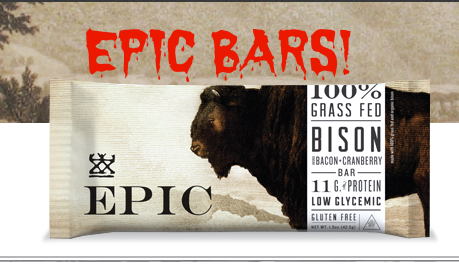 The beef Epic bar was the first taste test and wait until you hear our opinions. Watch and learn! Next we try the Turkey Epic bar. While not quite as offensive as the beef, it still brought fear and panic. It’s a wonder how as you chew these bars, they become dryer leading to a dissolving dust. This one also led to the hashtag, “Gone Full Franklin”. Watch and be entertained by our contorted faces and repeated thoughts of poop. So there you have it. If you want to be paleo/gluten-free/organic/grass-fed/low glycemic/humane then prepare to eat bars that have already been digested. But take my advice, just eat a steak.